Laser Weapon System (LaWS) Solid-State Infrared (IR) Shipborne Laser Goes Operational, Shoots Down Target Drone | DefenseReview.com (DR): An online tactical technology and military defense technology magazine with particular focus on the latest and greatest tactical firearms news (tactical gun news), tactical gear news and tactical shooting news. 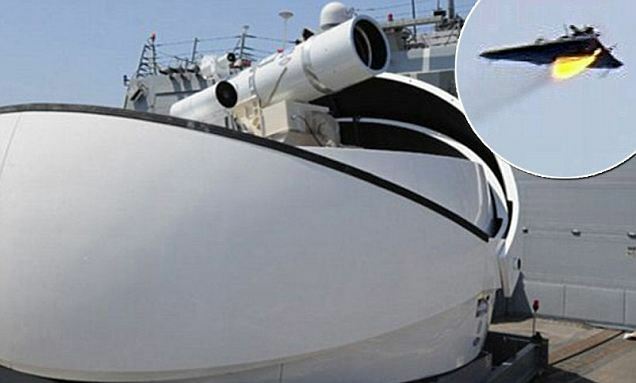 Yesterday, the U.S. Navy introduced and demonstrated it's latest high-tech weapons system, the Laser Weapon System (LaWS) solid-state infrared (IR) shipborne laser, to the world. The LaWS is the U.S. Navy's first operational/deployed laser weapon system, and while it may be embryonic, it most likely heralds the future of warfare. If Directed energy weapons (DEW's) don't end up dominating the battlefield this century, they will at least become a highly-significant aspect of it, provided Hague doesn't intervene, of course. DefenseReview (DR) sees laser weapon systems as a welcome complement to ballistic weapon systems, capable of killing everything from missiles to enemy combatants more economically than defensive missiles and bullets. Using radar and visual targeting and tracking, Navy operators have successfully used the LaWs to zap a slow-flying UAS/UAV/drone out of the sky and burn holes in small boats, but how far off can they really be from zapping fast movers (fighter aircraft)? It's just a matter of laser power and tracking speed capability. It shouldn't really be that hard. The endgame of all this laser-weapons tech of course is minimization, putting the same or greater power into a smaller, lighter platform. If you can make a weapons-grade laser small, light and powerful enough, you can arm fighter aircraft and helicopters with them, and eventually (theoretically) start arming infantry warfighters with man-packable/man-portable laser weapons, again provided Hague doesn't intervene. Again, laser weapons won't completely replace ballistic weapons (guns and missiles, but they're a great compliment to them. Anyway, the LaWs is expected to come in at approximately $30M ($30 million) per unit, which isn't exactly cheap, but the estimated cost-per-kill is exceedingly reasonable at "less than a dollar" per kill, according to reports. That sure beats the cost-per-kill for a missile defense system, and those aren't exactly inexpensive at the initial buy-in either. U.S. Navy Rear Adm. Matthew Klunder calls LaWs ability to remain stead and locked on the target as the weapon's "secret sauce", and the LaWs program manager at the Office of Naval Research (ONR) Peter Morrison likened it to a "blowtorch" with "burn-through capability to destroy critical elements on the targets themselves." So, what are the laser's current limitations besides target-tracking speed and power? Nature, apparently. Water vapor at sea looks like a biggie, so fog, clouds and the like would seem to be pretty big buzzkills, as well. This is why ballistic systems are also a must. The following portion of a Navy Times article intriged DR: Instead of relying on a variety of systems to track and engage an aircraft, for example, a ship could use its laser as a warning-signal of sorts, pointing it at the plane before dialing up the intensity if the intruder doesn’t change course. That's great, but if the laser is infrared, and therefore invisible to the naked eye, the only way personnel on a targeted aircraft or ship could see it would be with a thermal/IR or night-vision imager. So, ONR might want to incorporate a visible-laser aspect into it.